The movement of the train rocked me like a lullaby. I closed my eyes to the dusty countryside and imagined the sign I'd seen only in Gideon's stories: Manifest--A Town with a rich past and a bright future. Abilene Tucker feels abandoned. Her father has put her on a train, sending her off to live with an old friend for the summer while he works a railroad job. Armed only with a few possessions and her list of universals, Abilene jumps off the train in Manifest, Kansas, aiming to learn about the boy her father once was. Abilene throws all caution aside when she heads down the mysterious Path to Perdition to pay a debt to the reclusive Miss Sadie, a diviner who only tells stories from the past. It seems that Manifest's history is full of colorful and shadowy characters--and long-held secrets. The more Abilene hears, the more determined she is to learn just what role her father played in that history. And as Manifest's secrets are laid bare one by one, Abilene begins to weave her own story into the fabric of the town. Powerful in its simplicity and rich in historical detail, Clare Vanderpool's debut is a gripping story of loss and redemption. 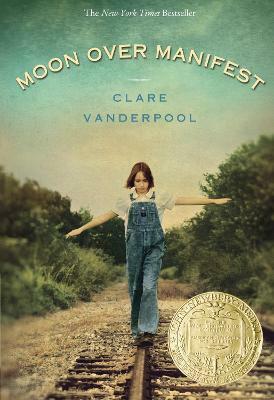 Moon Over Manifest, Clare Vanderpool's first novel, is set in the fictional small town of Manifest, Kansas, which is based on the real southeastern Kansas town of Frontenac, home of both of her maternal grandparents. Drawing on stories she heard as a child, along with research in town newspapers, yearbooks, and graveyards, Clare found a rich and colorful history for her story. Clare lives in Wichita, Kansas, with her husband and their four children.